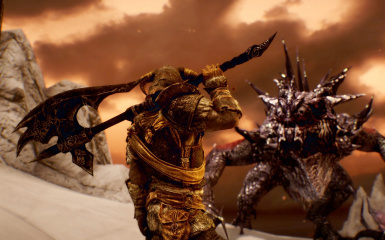 This mod replaces the two-handed sword animations. Current version changes only: Idle, Equip, Turn, Walk, run and sprint. This is compatible with Skyrim v1.6 update, I think. 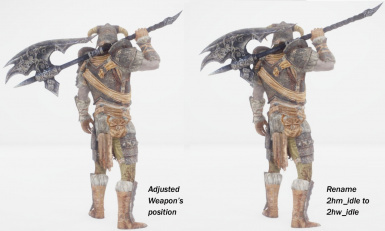 This mod replaces the two-handed weapon animations. Idle, Equip, Block, Turn, Walk, Run and Sprint. 2hm_sprintforwardsword_D1.HkX is an optional file. Remove "_D1" when you use. YOU CANNOT ACTIVATE "Male ver." and "Female ver." AT THE SAME TIME! -It looks strange when block enemy's attack. -Weapon's grip penetrate left hand when blocking.